It’s hard for me to review this issue of Amazing Spider-Man without mentioning “The Trial,” an episode of Batman: TAS that came out in May 1994. In that episode, a new DA argues that Batman is as responsible for Gotham’s super-criminals as anyone, and following a takeover at the asylum, she is forced to defend Batman against Judge Joker and Prosecutor Two-Face. Of course, in the end she realizes that the villains were always maniacs, and that it’s not Batman’s fault that Gotham City is a cesspool that breeds costume maniacs. Also Batman kicks the Joker in the face. My point is, it’s a strong episode of a classic show, and so when I read Amazing Spider-Man 403, it’s hard to not see it as fantastically derivative and inferior in basically every way. 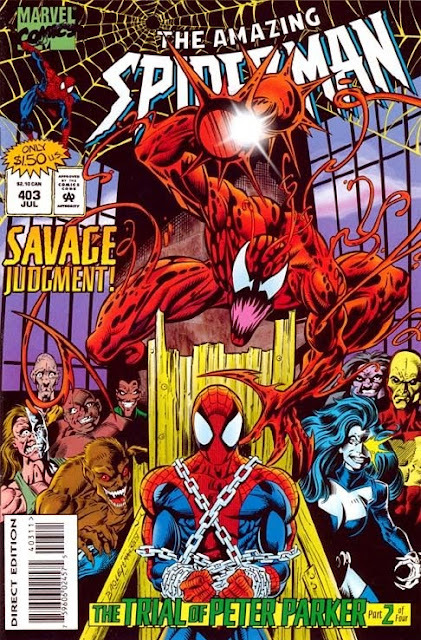 In this issue, Judas Traveller, the apparent cosmic being who keeps bugging Spider-Man (although fortunately not to ask him how to pee), has arranged a trial for Spider-Man’s “life—perhaps even… his immortal soul.” He has made Carnage the prosecutor, and Kaine, mystery-masked 90’s anti-villain, the defense attorney. Spider-Man thinks back how just minutes earlier he was trying to force Kaine into testifying in the trial of Peter Parker, as Peter’s clone Ben Reilly stands in for him in prison. Spider-Man’s internal narration immediately brings up that this scenario is so absurd Lewis Carroll could’ve dreamed it up, making me wonder if that was an intentional reference to the Mad Hatter taking over Arkham in the Batman version of this story. Kaine's more obsessed with face-touching than the dudes from Face-Off. Putting the "A" back in D.A. Meanwhile, back at the crazy Spider-Man trial, Kaine has vision #25205 of Mary Jane’s death, so he doesn’t object as Carnage questions himself, leaping in and out of the witness stand in a pretty cool moment. Carnage might be a better lawyer than D.A. Tower. 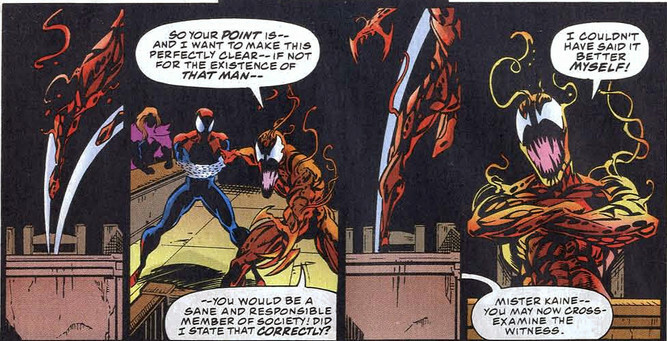 Kaine does a pretty good job on cross-examination, however, pointing out that Carnage was already a serial killer before he even met Spider-Man. When Carnage commits perjury (although I don’t think he was ever sworn in), Kaine immediately goes back to the face-touching. A paralyzed Spider-Man starts to wonder if maybe there’s more to Kaine than he thought at first. While he might be a murderer, he seems to have some inherent nobility. Plus, he’s really working that shoulder-length hair and tattered cape combo. I wasn't kidding about the face-touching. 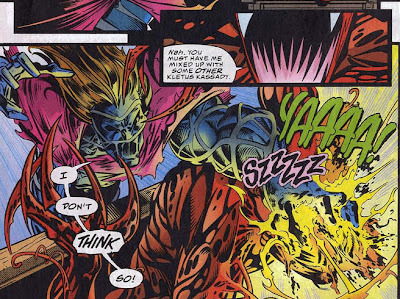 Carnage calls Malcolm MacBride, (sic McBride), the alter-ego of Carrion, a minor Spidey villain best known for his appearances in Maximum Carnage. 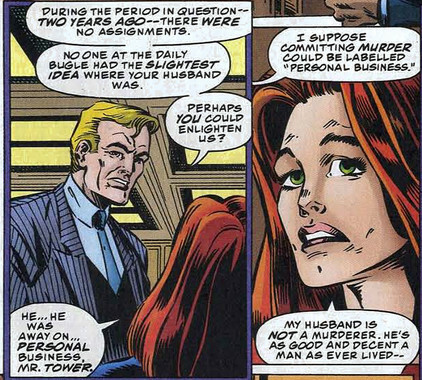 McBride insists he’s cured, but admits that he became Carrion in the first place in part due to jealousy of another student, a certain Peter Parker. Carnage responds by unmasking Spider-Man, and arguing that Spidey is a “psychic magnet for tragedy” who “destroys everyone close to him,” before running through a quick list of dead people Spider-Man knew. Spider-Man is so incensed by Carnage’s version of events that he breaks free and asks Traveller to hurry up and kill him if he’s that’s what he wants, because otherwise he’s got to get Kaine to the courthouse. In the meantime, minor Spider-Man villain Stunner laments Dr. Octopus’s murder with the detective who brought the original murder charges up. The two were apparently looking for Kaine when he disappeared. They bond over having both lost someone- in the Detective’s case, it was the use of his face that was lost. No offense, but having a scarred face isn't really the same as having your boyfriend murdered. Back at the surreal courtroom, the maniacs in the jury find Spider-Man guilty, and Traveller orders them to carry out the execution themselves. They’re stopped by Kaine, who fights off the group of villains for awhile, until Traveller reveals the whole thing has been a set-up, and that Kaine fighting to protect him was the *real* test of whether Spider-Man would be found guilty. The two are whisked back to where they started, where Stunner proceeds to kick Kaine while he’s down and threaten Spider-Man if he gets in her way. The issue ends with Carnage, singing maniacally to himself as he plots his future murder of the Parker family. Traveller appears in his cell and mind-zaps him, apparently erasing that memory. We get a blurb for “maximum clonage” next month. While the Batman version of this trial was built around showing that Batman’s not responsible for his villains and shows an antagonist coming to respect him, this issue is nominally about Spider-Man recognizing something good in Kaine, a mystery character who at the time was best known for popping up unexpectedly and murdering dudes. The issue doesn’t really address whether or not Spidey really is responsible for some of these things, as the story is continually interrupted by pointless fights that don’t get resolved. 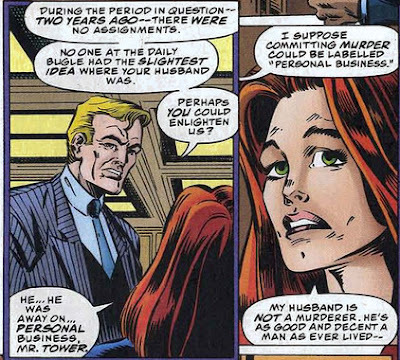 This is part 2 of 4 of the “trial of Peter Parker,” and feels the most like a fill-in of the 4, since we only get about one page of Pete’s murder trial, which is presented with far less accuracy than an episode of Law and Order. Basing a 4 part story around an OJ Simpson-style murder trial is stupid, of course, since murder trials are inherently less exciting than actual comic book action, but that’s a whole other problem. It’s also hard to deny that Traveller is just not a good Spider-Man villain. Right now he’s this ill-defined cosmic force that keeps messing with Spider-Man for no apparent reason, just to test how nobly Spider-Man reacts to some weird dude messing with him for no apparent reason. While I do sort of miss a few of these 90’s villains, I’m glad we never saw Traveller after 1997 or so. On the other hand, Bagley’s pencils are strong, and he does what he can to add some dynamism to an issue that is about not one but two trials, which is about as talking head-centric as you can get. My favorite bits are Carnage leaping back and forth to the witness stand, and Traveller showing his reality-warping powers by turning himself into a giant. Also, this being 1995, the editing is pretty sloppy, from mis-spelling “labeled” to getting Carrion and Carnage’s alter ego last names wrong, it makes the whole issue feel a bit more amateurish. All in all, it's a pretty below average issue from the book that had always been the flagship Spidey title. The writing is basically nonsensical, the editing is not great, and the pencils are above average but not all that exciting. 90's style: Carnage and his spikes-for-hands. Kaine's weird ribbed gimp outfit, complete with tattered, asymmetrical cape. Stunner's bare shoulder, spiked gauntlets look. I think she's supposed to be a commentary on comic book proportions, but who knows? I was never as fully invested in the Spider-Clone story as I was all the X-Men and Avengers stuff during this era (I didn't start reading Spidey regularly until well after the Clone Saga), but man o man, was I all about Kaine for awhile there. That’s not a question, and it’s just the attorney throwing his opinion out there to the jury. Which, of course, an attorney is only able to do during opening or closing arguments. And, as you later pointed out, where's the objection to this, defense attorney? This issue is right in the thick of the Clone Saga, during the monthly 4 part storylines that started a few months back and last until the end of the Scarlet Spider series (plural). Believe me, things will only get worse. LOVED the Clone Saga. Ate it up at the time, and I have all the new trades reprinting the whole deal. In retrospect it was a mess, but that doesn't decrease my enjoyment of it. 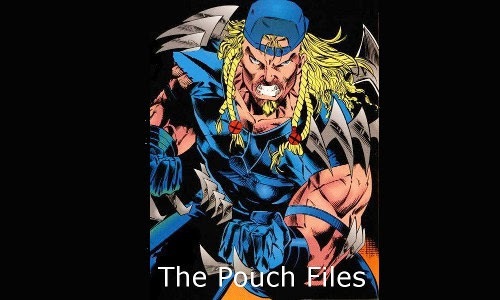 Regardless of the circumastances around his story, Ben Reilly was a great character. I'm always put off by the ever changing personality of D.A. Tower. I believe in recent years he's also gone physically from a dashing young fellow to a schlubby middle-aged guy. Also -- SPOILER -- As I recall, Traveler turns out to be a normal guy faking his cosmic power. I don't believe that revelation reconciled very well with the stuff he was shown to do in his earlier appearances. Having recently read a bunch of 90's comics as part of this project, I will say that Spider-Man fights tend to be pretty exciting during this period. If you were a kid who liked to see people get punched, Spider-Man and the Batman comics were really your best bet. As for Traveller, I vaguely remember Scrier was revealed as the true power, and Traveller was just a mutant with some sort of illusion-based powers. I think it was Life of Reilly that said one "get out of the clone saga" idea was that Traveller reveals he's Mephisto in some other form and faked the results as part of some cosmic bet. 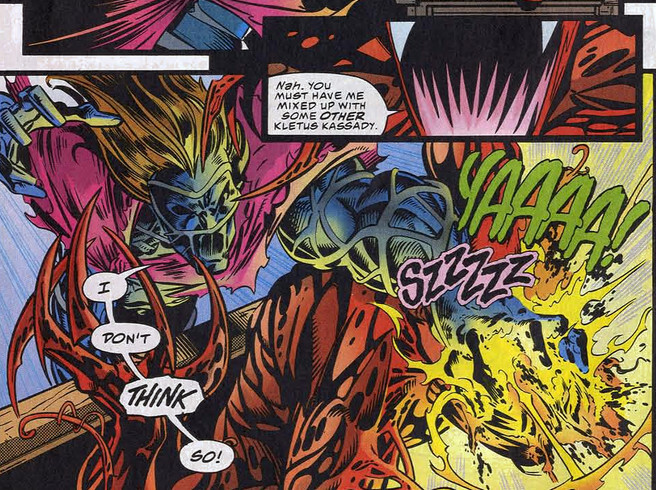 But Mephisto in a Spider-Man comic was too dumb even for 90's Spidey comics. Thanks for reading! You're right, he was a mutant! I forgot. I guess that explains it a bit better. It was Scrier who turned out to be a normal guy -- or rather, a bunch of normal guys all wearing the same outfit. But they patterened themselves after some all-powerful entity of millennia past, who later showed up in Silver Surfer. It's coming back to me now. First Post! New Project! Radical!